Click on the image below to see the 3D animated video of Your Clothes plus some others in a selected playlist. Video song story about children’s clothes with upbeat, funny music and a cute band of monkeys playing the tuba, accordion, piano, drums and the spoons! Lots of little subtle mishaps occur for the monkeys in this video so keep a look out! It’s educational for learning colours, parts of the body, and pieces of clothing for very little ones and entertaining for older children as they notice the more subtle features in the video for them! Children will recognise these same monkeys from our counting song story video with the Caribbean music “Five Green Monkeys“. Five Green Monkeys Video $3.90. Also available in a singalong version. And the children characters, Toodle and Doo are from the song story video “Toodle Toodely Doo” where the animals say “hello” in different languages! 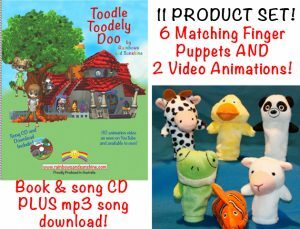 Toodle Toodely Doo also has a book and finger puppets, making it one of our signature products. You can see more details under BOOKS AND TOYS. There are no ads in your purchased copy of this video and at almost 4 minutes long it’s great value! And if you’d like to see the lyrics on-screen we have another version – this makes it very easy for everyone to sing along! You can see it here – Your Clothes Singalong Version! Rainbows and Sunshine have lots of fun song-stories – see our VIDEOS page, BOOKS AND TOYS, or SONGS, and our amazing “complete sets” which have matched books/songs/videos/toys for complete learning, sensory awareness and entertaining experiences. Check out these two popular signature sets: BLACK AND WHITE COW and TOODLE TOODELY DOO. Above is a selection of our videos – do play for your little songsters and enjoy, and we would really love to receive an email or comments, subscribes and shares on our Facebook page. All of our products are for sale too and the proceeds go directly to our community book donation program for children-in-need.